Damon owns and operates a pawn shop, ultimately, a front for selling drugs through a crafty system where it isn’t uncommon to see the haggard and decrepit walking out with Duran Duran’s Hypnotize in hand. Mary, Damon’s girlfriend, has a history with Damon’s supplier, which Damon believes is the reason why there’s a hold-up on Sunday deliveries. Though, what Damon believes is always a little on the paranoid side of the street as he begins dipping into his own product, before diving face first. Mary starts hinting at marriage when the jasmine scented lady in red shows up on Stay Gold’s doorstep with the answers to all of Damon’s ills. And then the whole world turns over in a chaotic stroke as Mary disappears, homicidal twins start hunting people down, and Damon’s old ghosts begin haunting him to a catastrophic degree. 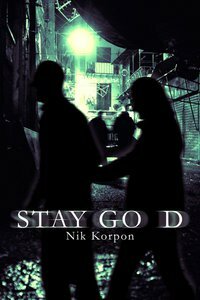 Stay Go_d, a title that nods to The Outsiders, is a book full of pop-culture references and name-drops of people in, author, Nik Korpon’s life. If you’re amongst his circle, the book reads like a Kevin Smith movie at first, seeing names like Gordon Highland (author of Major Inversions), Richard Thomas (author of Transubstantiate), Caleb J. Ross (author of Stranger Will and the upcoming I Didn’t Mean to be Kevin (November 2011)), and fictional characters like Phineas Poe (Kiss Me, Judas). One might think that such a move is used to mask a lack of content or style, but really, in the case of Stay Go_d, there is no shortage of either. Korpon brings a voice all his own to the dirty streets of Baltimore and tags the crumbling walls of the city with a story about self-destruction. Korpon’s debut novel follows Damon as his drug addiction and predilection to alcohol spirals wildly out of control when he needs a sober mind most. Some would argue that Damon is a victim of circumstance, some would say he put himself down the path of destruction. Stay Go_d isn’t really a book about the main character learning and changing from his mistakes, he doesn’t have that “Ah ha!” moment that most readers pine for and cherish. Life isn’t always full of those moments. However, life is a ride where people fade in and back out of our lives, sometimes reigning down death and destruction when we need both the least, and sometimes we’re able to sit and argue about who’s the better superhero. Life, and Stay Go_d, is about the ride. Hopefully, after we’ve snorted all of the life and death that we can handle, after we’ve drank all of the poor decisions that the bar will hold, after life presses the muzzle of a gun to the bridge of our nose and asks us to chose, we make the right decision. Or at least, the right decision for right then and there.